When considering exterior speakers you’ll want something built well enough to survive the outdoors but will still give you the performance to make it enjoyable. Designing speakers for the outdoors is a challenge. There’s the obvious practicalities of the outside environment plus little or nothing to work with acoustically. So getting good sound dispersion and achieving detail, bass, warmth and clarity becomes all the more difficult. Monitor Audio specialise in speaker design so with their 'Climate speakers you can enjoy the dynamic and musical sound of Monitor Audio outside on your deck, in your courtyard, BBQ area, garden or around the pool. Outdoor living is intrinsic to the New Zealand lifestyle. These are times when we’re relaxing or having fun with friends and family. So when planning your home music system don’t forget your outdoor living areas. The sound from a good quality Hi-fi will drift around the house but for specific areas like this it’s nice to have more control. Separate outdoor speakers mean you can have your music where you want it and at the volume how you want it. Thus adding a simple but worthwhile enhancement to your home life. …add around 60mm to the depth to include the bracket and more for the optional angle block. 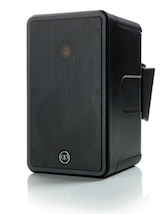 Visit the Monitor Audio Climate page for more details and specifications.